How a visit to Pune led the foundation of StreetBazaar, a portal for quality non-branded products? Started from Indore in October 2014, StreetBazaar is a young and passionate company serving the fashion needs of women accessories with good quality non branded products. StreetBazaar is a one stop shop for all your fashion and lifestyle needs. StreetBazaar aims at providing an enjoyable shopping experience to shoppers with the widest range of non-branded street items on its portal. In February 2015, the portal expanded to offer clothing, and in just 10 months got over 10,000 registered customers on board. Why we chose StreetBazaar as Startup of the Week? • In just 10 months, the portal got over 10,000 registered customers on board. • It came with unique idea to cater the customers with quality non-branded items. • The site has also added Bollywood fashion replicas. • USP of the company is original local fashion. 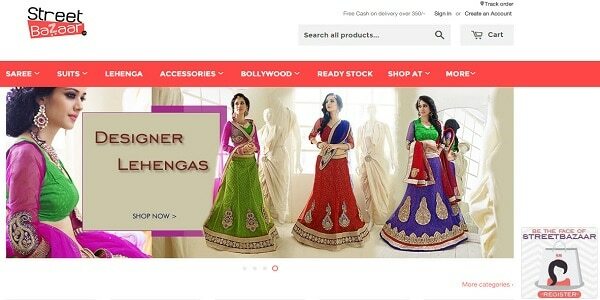 • The company is working to tap the ethnic wear market size of more than 7,000 crore. • Around 58,000 Facebook fan following in a short span of time. • 10200 followers on Twitter. • More than 1000 followers on Instagram. 1) How Curofy, an idea of 3 IITians is changing the health sector in India? 2) How “Yessettle” came up with the idea to become world’s first online disputes settlement platform? The company’s founders, 26-year-old Neeraj Vani and 24-year-old Surbhi Vani, loved to walk through shops. Once both were in Pune for some work and decided to go street shopping during their free time. But the duos couldn’t find any good street markets, possibly because they didn’t know if there were any or where they were. All they could find were shopping malls. That’s when they both felt the need – to create an online street shopping store, and hence result was StreetBazaar.in. Neeraj being a BE graduate from IPS College, Indore, completed his diploma in entrepreneurship from IIT Delhi. When he kept his mind to start up StreetBazaar, most of his friends were unconvinced. “Surbhi is also an MBA, and to startup with their idea, they both had to leave their 9 to 7 job. Most of their friends stay unconvinced and told it a stupid decision. But the spirit inside Neeraj and Surbhi was sizzling. They knew that they could succeed because only dead fish go with the flow. In addition to bags, which they started with, the site also features a wide range of artificial fashion jewellery, all priced – from a couple of hundred rupees to under a couple of thousand, on average. “We plan to add more vendors, apart from expanding into new markets, including overseas. While our USP is original local fashion, keeping in mind market demands, we have also added Bollywood fashion replicas (including evening gowns),” adds Surbhi. These popular party-wear gowns are priced between Rs 2,899 and Rs 5,799. “We have seen many online shopping platforms advertising many superb ethnic and regional products. But one concern we saw there was that they often compromise on quality keeping prices high. So we thought we would provide customers original ethnic apparel at affordable rates,” explains Surbhi. The venture is currently bootstrapped and earns revenue through a commission they charge to their sellers. The company has plans to increase its customer base, and expand its reach in the market. Getting more vendors on the platform and technical innovations will be the main focus for next three years for the company.